Last night, I grabbed some beer out of the fridge and settled in for the reboot of The Exorcist. I was excited, but really didn’t know what to expect. Quite frankly, I had no idea how this could be successfully adapted for television, but I had loved Outcast (the Cinemax show about well, an exorcist), so I thought this could be worth a shot. First of all, let me say this probably will be a good TV show, at least for a couple of seasons, but it really wasn’t that evident in the first episode. I had to watch the premiere three times in order to pay attention to the entire episode and lots of the little details. The last 15 minutes is amazing… but the rest of the episode is so slow, I had trouble following everything that was happening. Things that should be explained more are not, things that should be explosive and interesting are underdone. The series premiere does a good job of introducing the two priests to the audience. I, of course, would have much rather spent that time in the Rance’s home, figuring out what was going on and having the priests slowly revealed to us. The Rances are an upper middle-class family, whose daughter has just returned from college after an accident. She is now sullen, rarely leaves her room and depressed. Her mother hears noises in the walls and things are moving around the house. Her husband has also recently been diagnosed with dementia. The premiere spends very little time introducing us to the family. I really do not feel any connection to them or their more-than-likely possessed daughter. I do think the scenes with “the possessed” were rather good and she does a wonderful job with her character. Here is to hoping in the next episode, we will get to better familiarize ourselves with the Rances. Father Ortega is a young, handsome man who we are led to believe possibly struggles with the fact that he could do more or be more than a priest. He isn’t one to immediately believe there are “other” forces at work, but continually has dreams where he is present during an exorcism, one where Father Keane is presiding and loses a battle with a demon. We are also introduced to flashbacks of Father Keane rebelling against the church, in order to save the life of a young possessed boy in Mexico City. When he loses this battle, he is obviously devastated. Father Ortega seeks him out for help with the Rance’s daughter later in the episode, and he isn’t exactly in a rush to help him out. When we finally get to the good part… which is right at the end, it is worth the wait. The scares are there and the story immediately picks up. Plus, ending the show with the classic exorcist score equals perfection! I just hope the series starts to focus more on the tormented family than the tormented priests. Being on network TV, this might not be able to live up to the expectations people have for a series about The Exorcist. I really can’t say yet. I think that they are hoping the atmosphere will make up for what they can’t get away with on basic network television. Quite honestly, so far, it does come pretty close. I have rarely seen a network TV show spend the obvious time and money this show has spent on lighting and set design. The atmosphere was turned up to 10. They will have to pick up the pace to keep viewers coming back. Somehow, they are also going to have to come up with a new way to express the scares that the film used. I doubt we are going to see anyone, um… sitting on crosses in this show. This episode relied almost entirely on atmosphere and a few cheap scares, but that won’t work week after week. The ante will have to be ramped up! While this first episode did get off to a very slow start, the show does have real promise. What is the end game the “dark forces” have for Father Ortega’s sleepy parish? I give The Exorcist three stars for one of the creepiest set-and-lighting designs I have seen on network TV and one of the scariest daughters on a FOX TV series, besides maybe Meg from Family Guy. 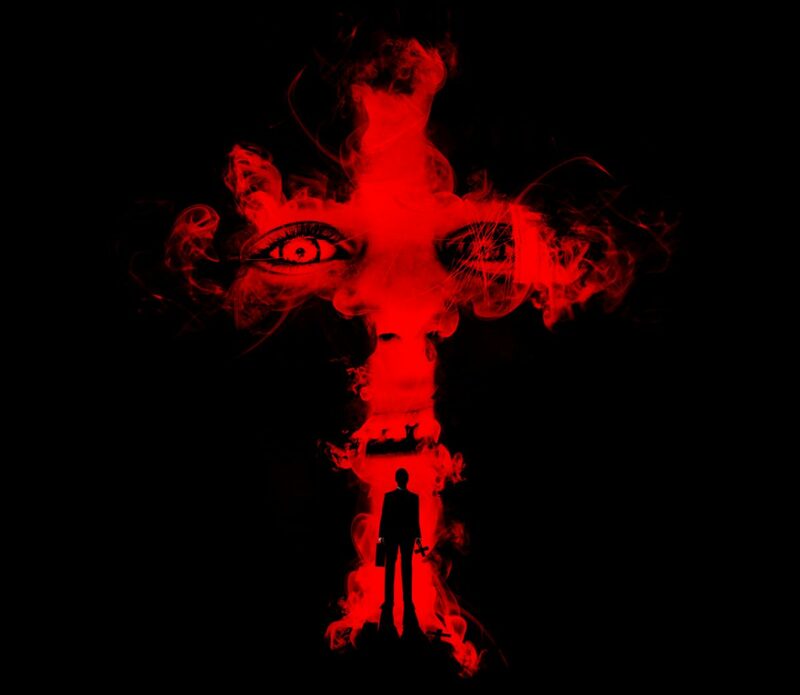 The Exorcist airs Friday nights at 8pm central on FOX.